President Vladimir Putin has dismissed suggestions that Russia could face war crimes charges over its bombardment of Syria's second city Aleppo. He told French media the accusations were "rhetoric" that did not take into account the realities in Syria. French President Francois Hollande had suggested Russian air strikes on Aleppo could amount to war crimes. The rebel-held east of the city is under renewed bombardment after a ceasefire deal broke down. Despite recriminations over who was to blame for its failure, Russia and the US agreed on Wednesday to resume talks on Syria. Foreign Minister Sergei Lavrov will now meet his US counterpart John Kerry and other key regional powers in Switzerland on Saturday. 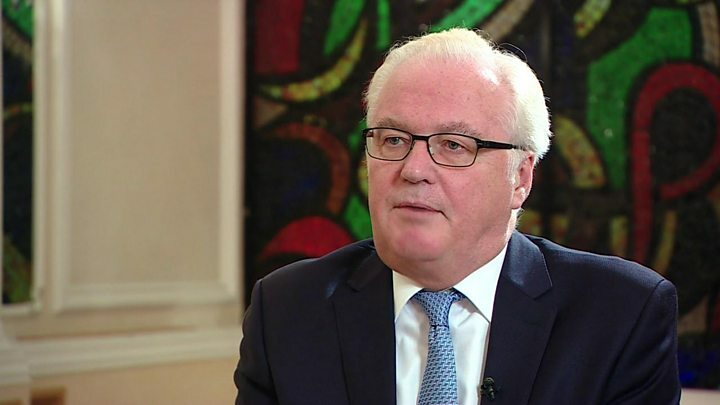 Russian UN Ambassador Vitaly Churkin said he hoped some progress would be made at the talks but admitted it would be hard. Speaking with the BBC's Lyse Doucet in New York, he said there was international disarray over how to end the fighting. Mr Churkin too rejected allegations of Russian war crimes in eastern Aleppo but expressed what he called incredible regret over civilian casualties. He said if they were caused by his country's bombing it would be a heavy burden on Russia's psyche and soul. Mr Putin told France's TF1 TV channel that Russia would pursue "terrorists" even if they hid among civilians. "We can't allow terrorists to use people as human shields and blackmail the entire world," he said, adding that civilian deaths were the "sad reality of war". Responding to claims that Russian air strikes on civilian areas amounted to war crimes he said: "It's political rhetoric that does not mean much and does not take into account the realities in Syria. "I am deeply convinced that it is our Western partners, first and foremost of course the United States, who are responsible for the situation." Russia has accused the US of secretly supporting al-Qaeda-linked jihadists in Syria in its bid to topple Syrian President Bashar al-Assad. The US rejects the claim. Earlier this week, Mr Putin postponed a planned visit to France after Mr Hollande insisted that talks would be confined to Syria. The Kremlin was also angered by a Franco-Spanish UN Security Council resolution on Aleppo at the weekend that Russia vetoed. "They put forward the resolution knowing that it would not pass... in order to incite a veto," Mr Putin said. "Why? It was aimed at inflaming the situation and fanning hysteria around Russia." Moscow has repeatedly denied attacking civilians, saying it targets terrorist groups in Syria. But earlier this week, Mr Hollande said: "These are people who today are the victims of war crimes. Those that commit these acts will have to face up to their responsibility, including in the ICC [International Criminal Court]." Washington broke off all negotiations with Moscow nine days ago amid extreme tension over failure to secure a truce. The US State Department said that in Saturday's talks Mr Kerry would discuss a "multilateral approach" to ending the crisis, "including a sustained cessation of violence and the resumption of humanitarian aid deliveries." The key regional powers, Saudi Arabia, Turkey and Iran are also expected to attend the talks in Lausanne. Mr Kerry will follow his talks in Switzerland with a trip to London on Sunday. 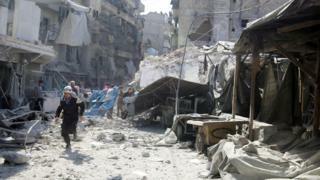 The UN has appealed for a halt to the violence to allow aid into the besieged territory. On Wednesday, at least 15 people, including children, were killed in an air strike on a marketplace in a rebel-held part of the Syrian city of Aleppo, activists say. The strike was one of 25 in the rebel-held east on Wednesday that left a total of 25 people dead, they added. Government forces, backed by Russian warplanes, launched an all-out assault to take control of Aleppo last month. The Syria Civil Defence, whose rescuers are known as the White Helmets, said a number of women and children were at the market in the Fardous area when it was hit. Video purportedly showing rescuers coming under attack from the air as they tried to rescue the injured was also shared on social media by pro-opposition activists. Aleppo, once Syria's largest city and the country's commercial and industrial hub, has been divided roughly in two since 2012, with President Assad's forces controlling the west and rebel factions the east. On 4 September, government forces re-imposed a siege on the east, where about 275,000 people live, and launched a major offensive to retake it after the collapse of a truce brokered by the United States and Russia. Since then, the bombardment has killed more than 300 people, according to the UK-based Syrian Observatory for Human Rights.